Looking for a Christmas gift for a keen baker? If there's somebody in your life with a penchant for patisserie, who's barmy about bread-making and crazy about cake; if you are greeted by the of sweet smell of freshly-baked goodies every time you step through their door, or if there is a go-to person for birthday bakes in the family, who is glued to every episode of Great British Bake Off, you've come to the right place. We’ve rounded up the perfect selection of treats to butter them up this Christmas. Fingers crossed you get to taste the results too! If they're keen cooks why not team your baking gift with one of these scrummy gifts for foodies, too. Check out our list of kitchen buys every Bake Off fan should have, too. And, if baking isn't their thing then check out our other gift guides, yes, we've pretty much got everyone covered, from gardeners to vintage lovers. Or, you could take the legwork out of your Christmas shopping by checking out the Real Homes and Period Living teams' top 50 Christmas gifts for 2018: we want them (and so will you and your friends and family). A must-have for showing off that fresh batch of perfectly risen scones or showstopper Victoria sponge, a classic cake stand is always a safe bet. Sometimes it can be tricky to know what kind will suit their tastes, so if in doubt go plain and simple. Designed to suit any kitchen, Garden Trading’s Brompton range is includes timeless pieces such as the classic Brompton cake stand along with matching storage canisters. Coveted by passionate home cooks for a century, KitchenAid has introduced Misty Blue to its Artisan mixer collection in celebration of its 100th anniversary this year. With a hobnail bowl made from titanium-reinforced ceramic, and over 15 optional accessories for everything from slicing to spiralizing, the mixer, £699, will be top of Santa’s wish-list for many. Get it now at QVC. Looking for a gift with that personal touch? This year Dobbies are offering a build-your-own baking hamper service allowing you to customise the contents for that special baker. Take your pick of everything from mixing bowls and cake tins to aprons and recipe books. At Period Living magazine, we think it’s hard to beat the retro weighing scales, but these Salter conversion electronic scales are pretty nifty, too. Offering the best of both worlds, they feature digital weighing, but also have lovely retro graphic conversion charts for easy reference which include length, temperature, liquids and cups. Exclusive to John Lewis. Every baker needs a good pair of oven gloves for those bubbling crumbles and steaming hot mince pies. Featuring everyone's favourite bright-eyed and bushy-tailed forest friend, the new Squirrel & Spruce kitchenware collection from Thornback & Peel will delight cooks and nature-lovers alike. Featuring their signature vintage-style illustrations, the design is also available across aprons, tea towels and coasters. Embossed with pattern reminiscent of Scandinavian knits, this rolling pin will add a festive flourish to Christmas biscuits. Find it and similar designs at Lemonbaum's Etsy store. A baking essential, the magic starts in the mixing bowl. Serving cooks and bakers since 1899, Tala offer a range of bakeware and cookware in a variety of colours, including the 5.5ltr stoneware mixing bowl in festive red. Featuring a modern twist on the classic blue and white floral china, these lovely Sass & Belle measuring cups will brighten up any kitchen dresser, and for under £15 they make a lovely stocking filler for bakers. Dazzle bakers partial to a bit of sparkle with some statement accessories. From whisks to sieve sets and measuring spoons, bakers won't want to hide Audenza's gold utensils away in the drawer! 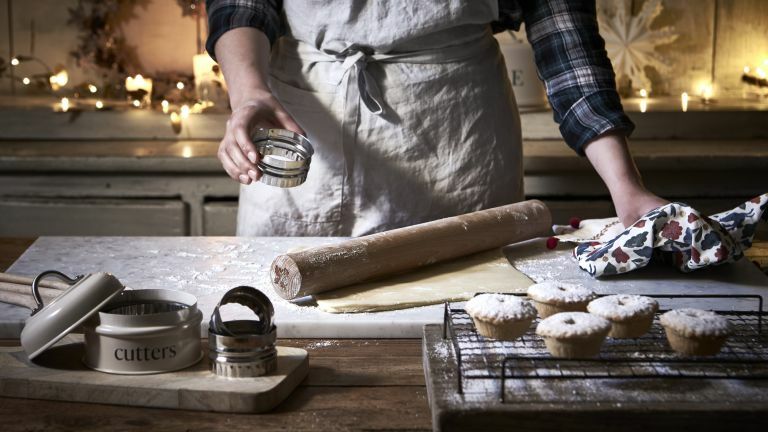 A good set of pastry cutters is essential for preparing those perfect mince pies and classic scones. The National Trust has a set in a lovely vintage-style presentation tin for just £12, along with a plethora of baking goodies from crumble recipe books to a build-your-own gingerbread house kit. Featuring tasty seasonal recipes in each monthly issue, Period Living magazine is a brilliant gift to inspire future culinary creations while the magic is happening in the oven and what's more, this month there's a spectacular 42 per cent off subscriptions as a little Xmas treat from us.